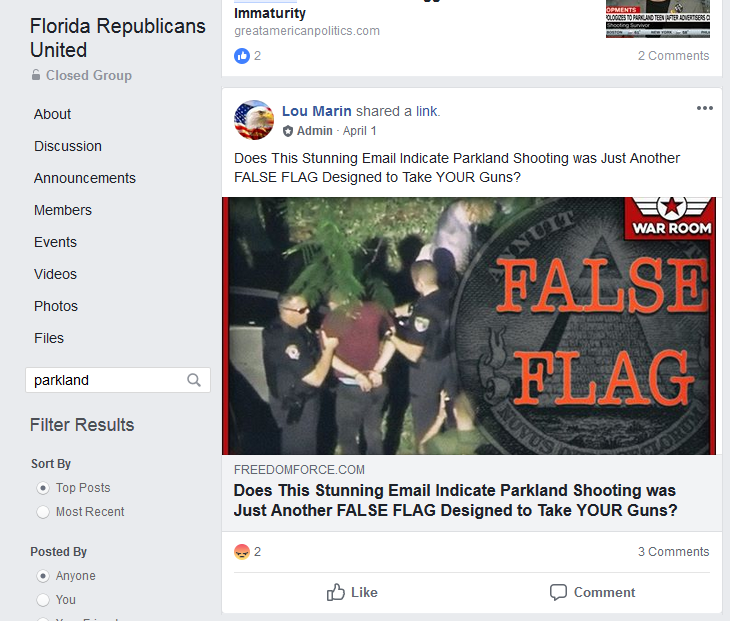 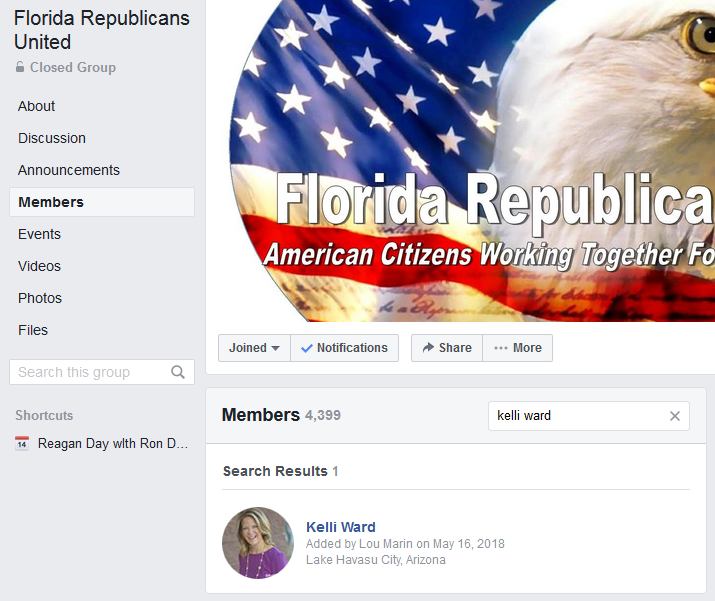 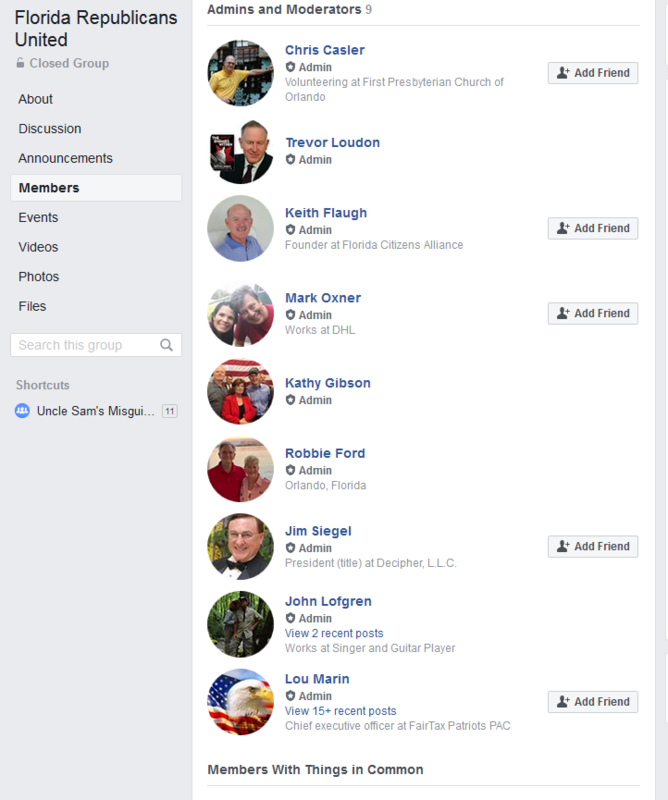 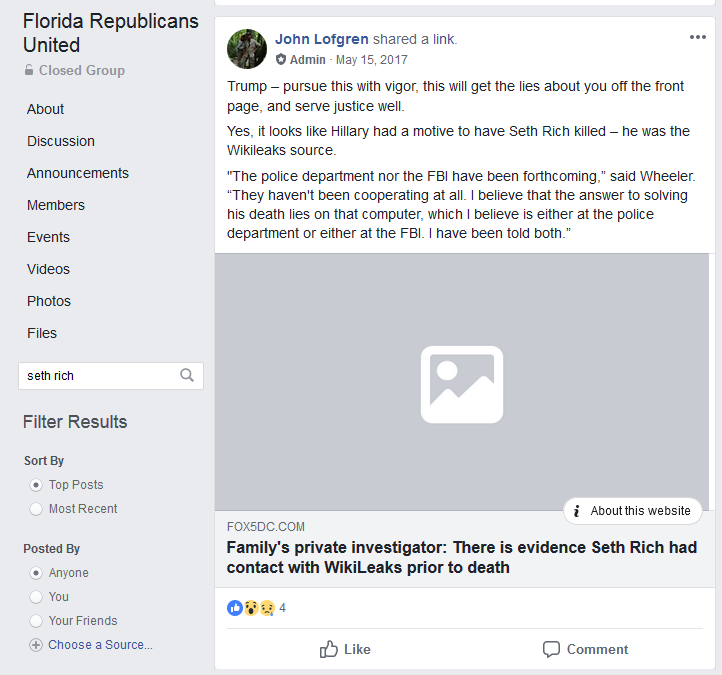 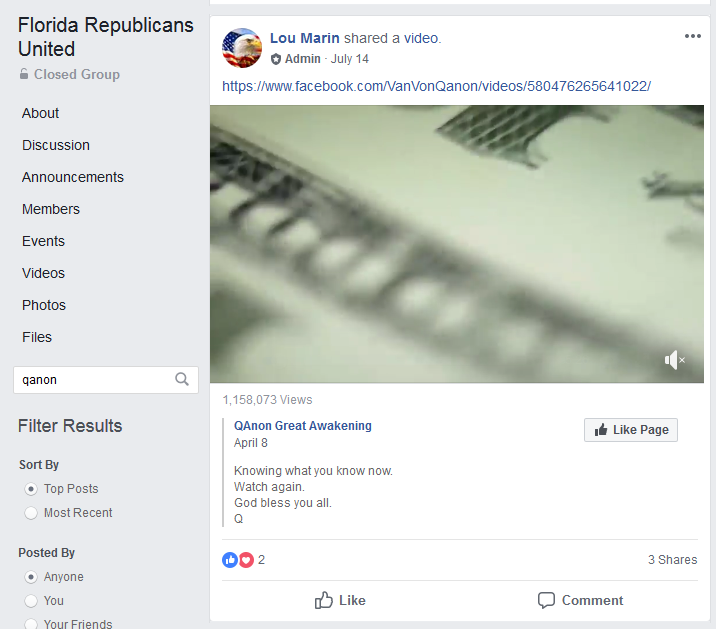 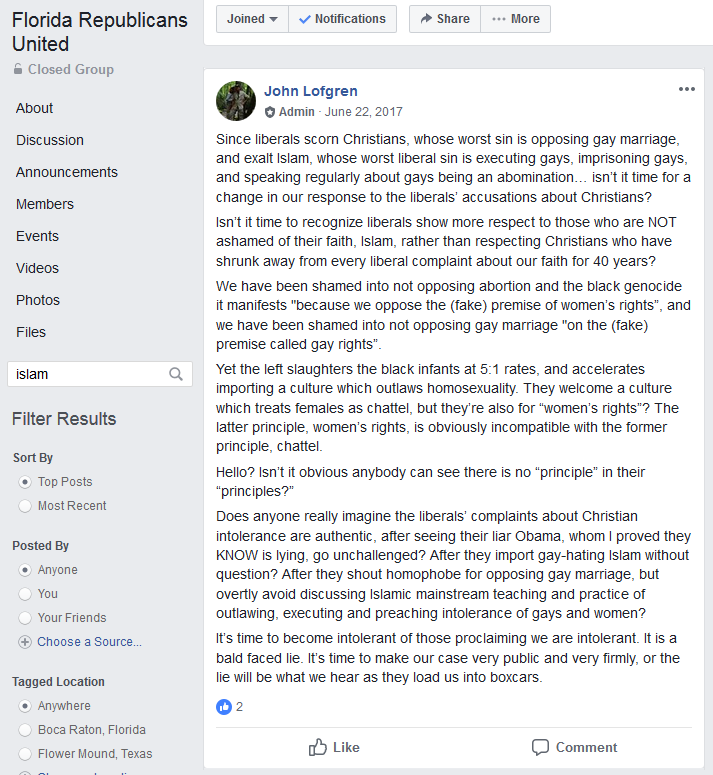 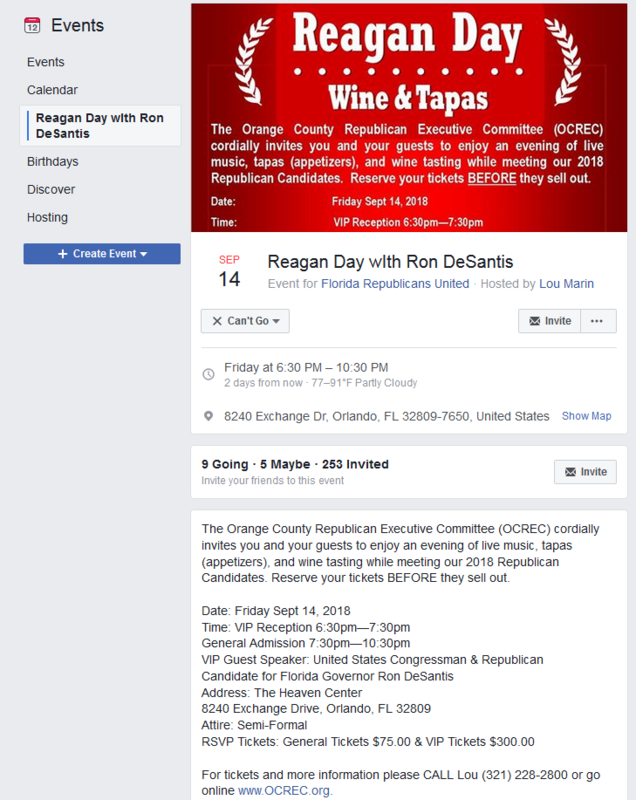 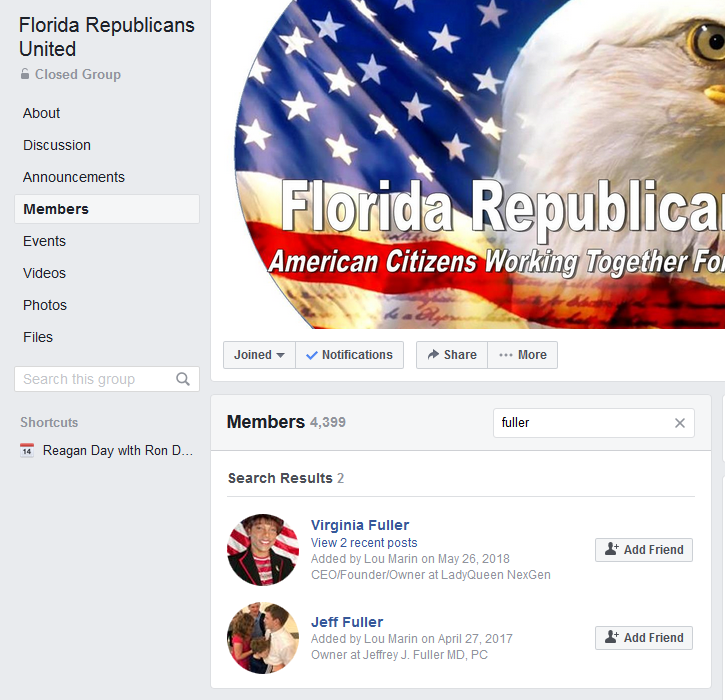 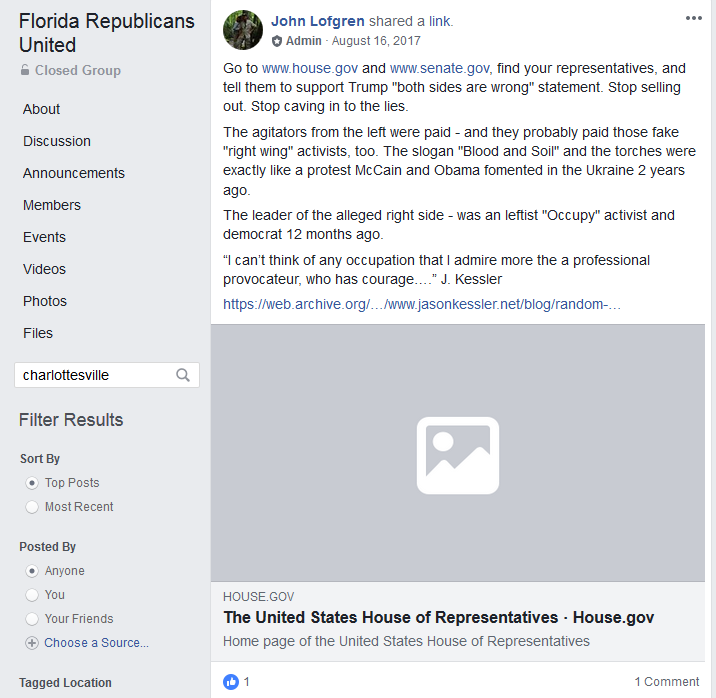 Two Orange County Republican Party officials in Florida are administrators of the private conspiracy theory Facebook group Florida Republicans United. 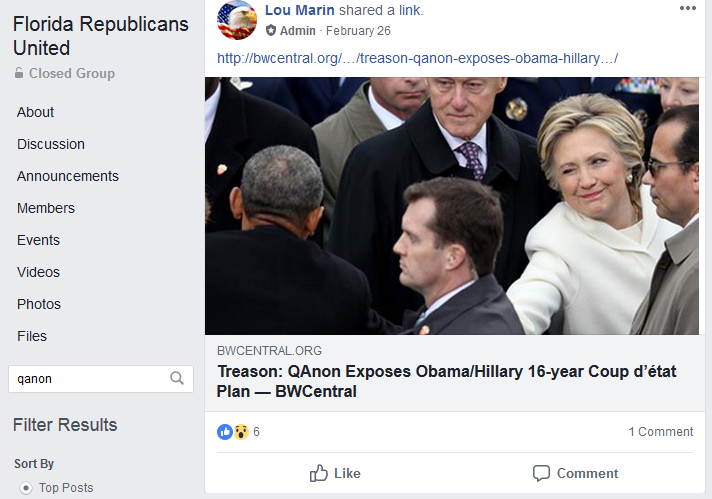 Lou Marin and Kathy Gibson are the vice chair and state committeewoman, respectively, for the Orange County Republican Executive Committee. Gibson recently came under fire for posting a racist meme targeting Florida Democratic gubernatorial candidate Andrew Gillum, which she claims was posted by someone who had hacked into her Facebook account. 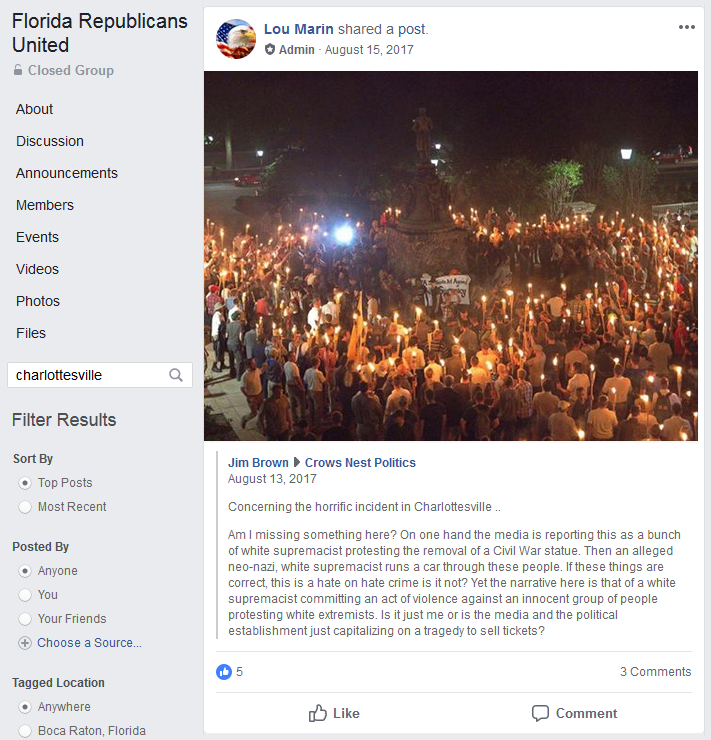 Administrators, including Marin, have pushed far-right conspiracy theories like QAnon and others related to the Parkland shooting, the Unite the Right rally in Charlottesville, VA, and the murder of Democratic National Committee staffer Seth Rich. 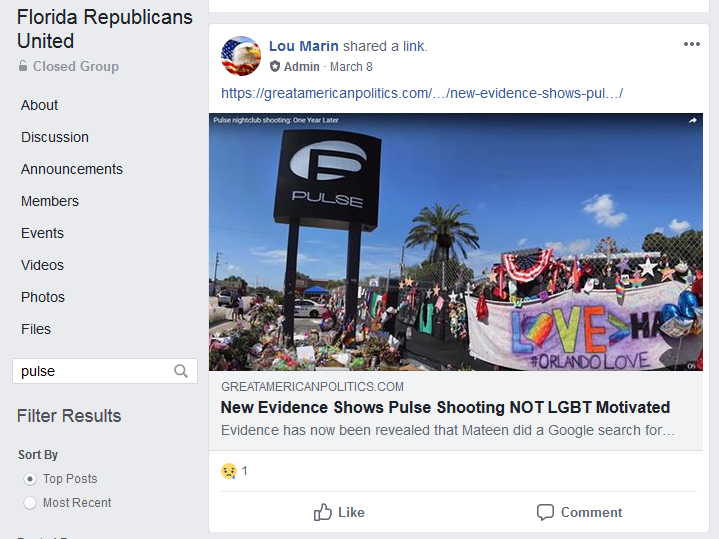 They have also posted anti-LGBTQ, anti-immigrant, and anti-Muslim content. 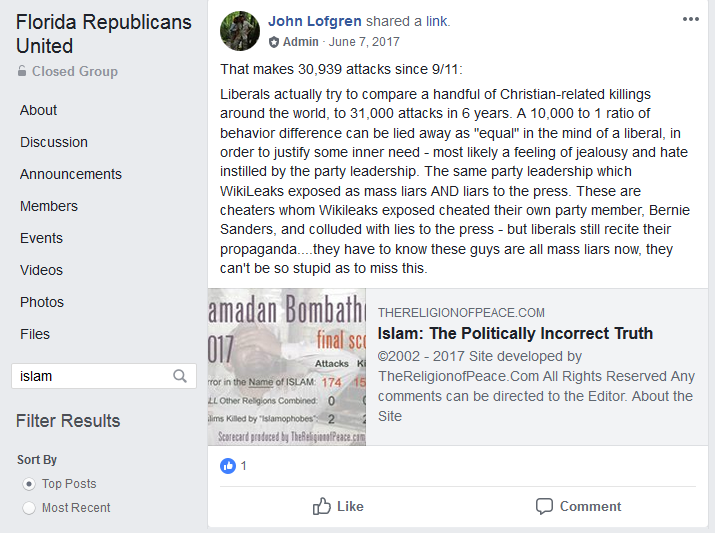 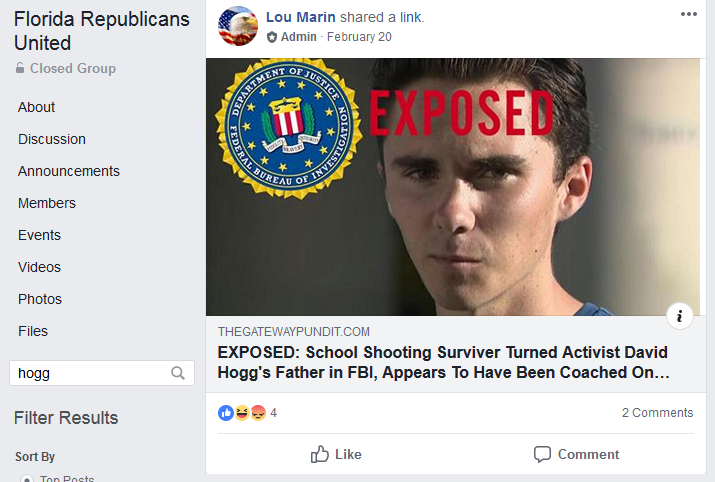 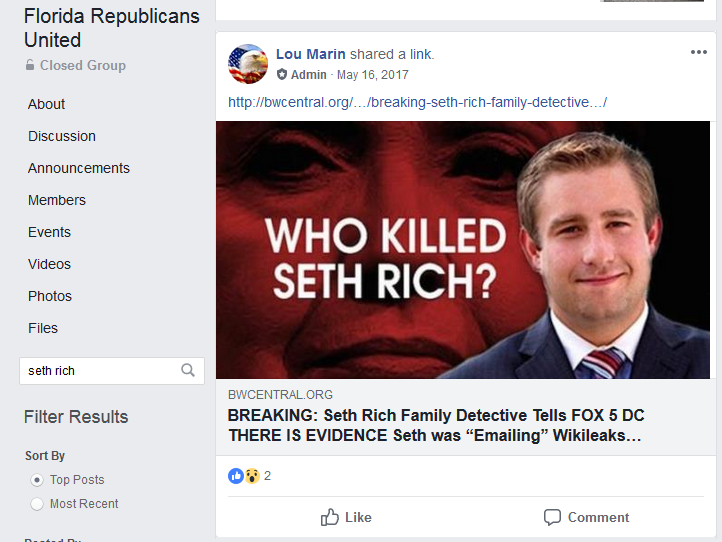 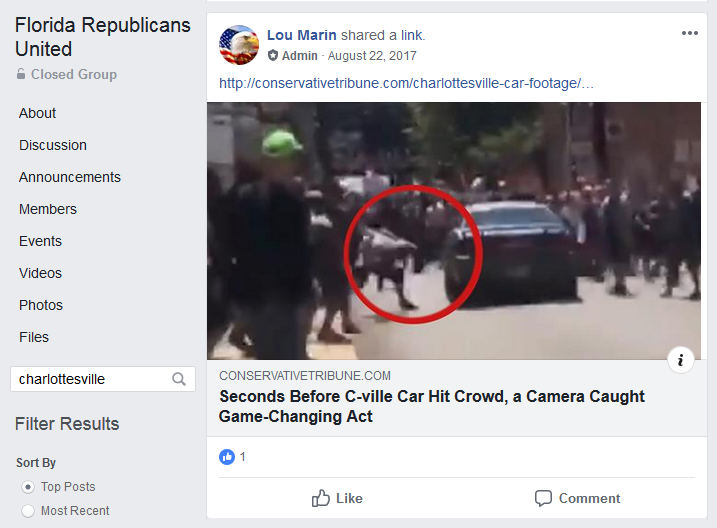 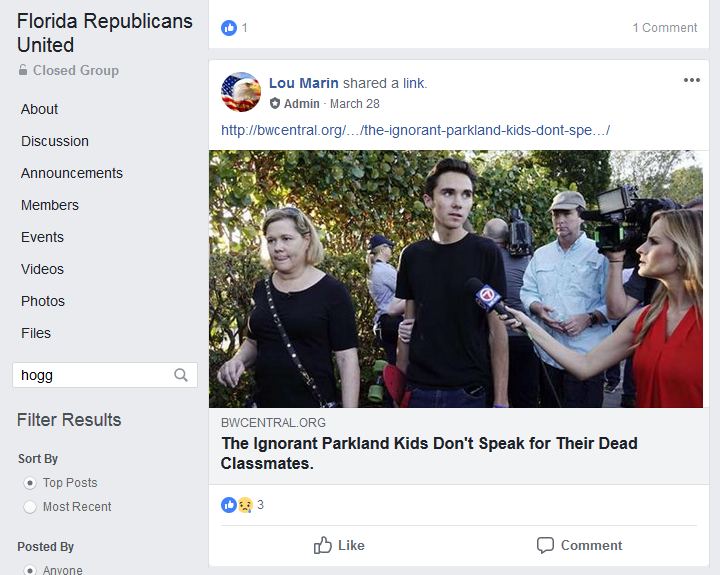 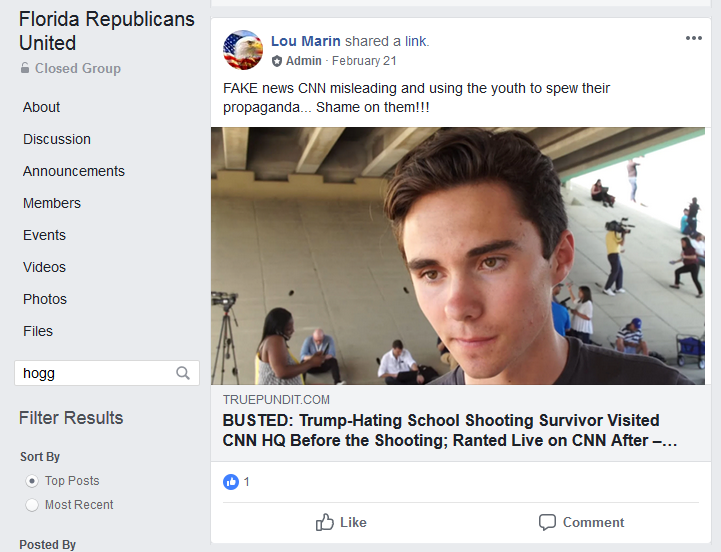 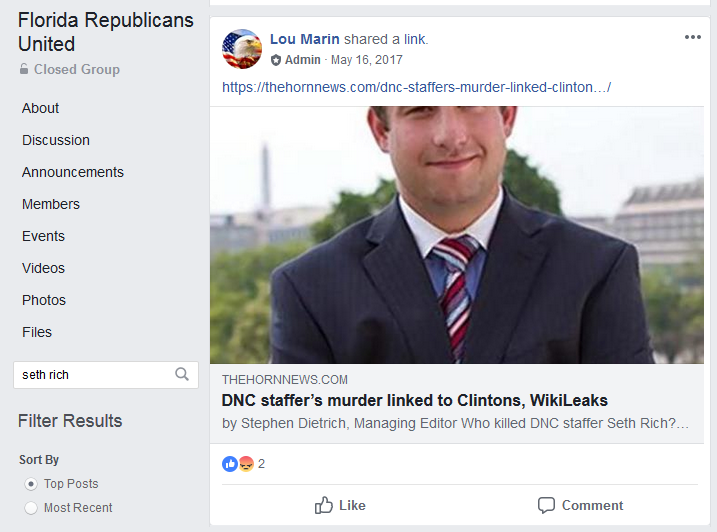 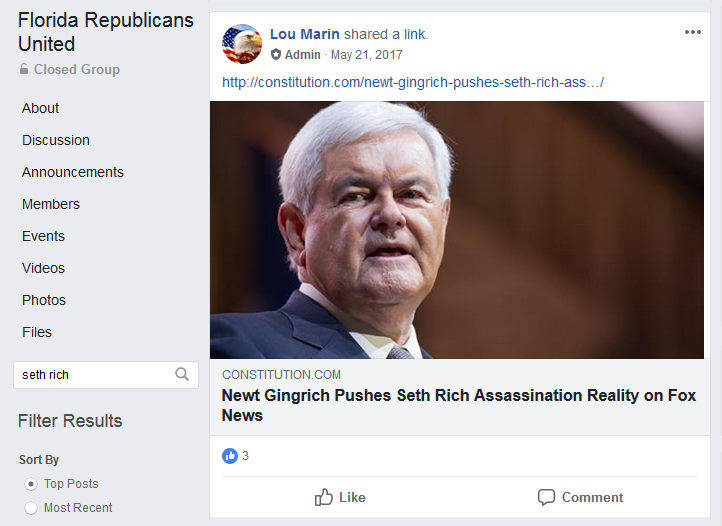 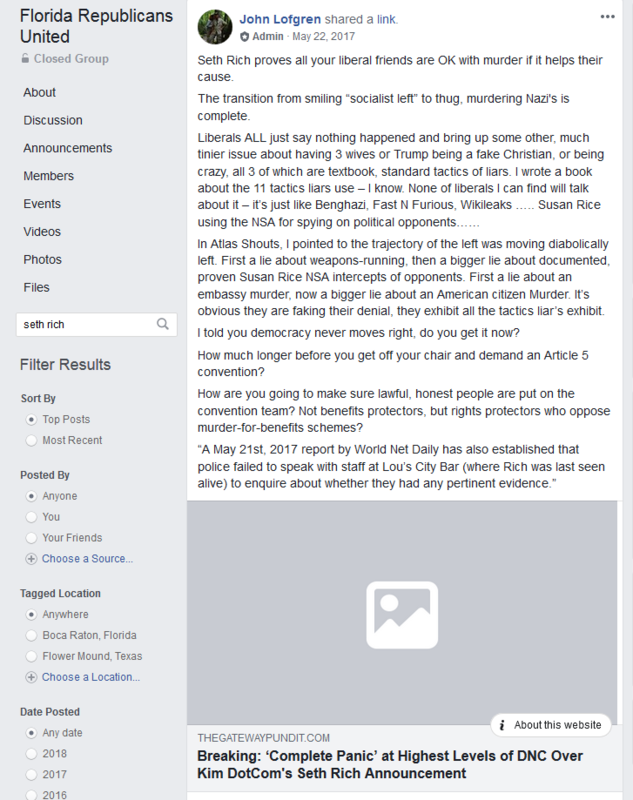 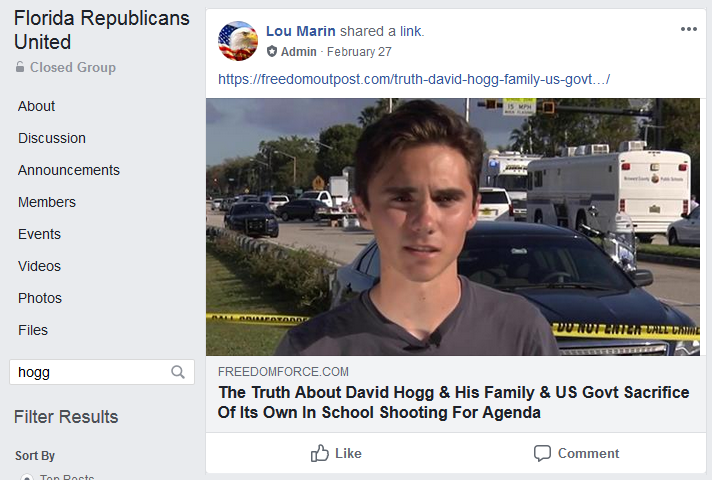 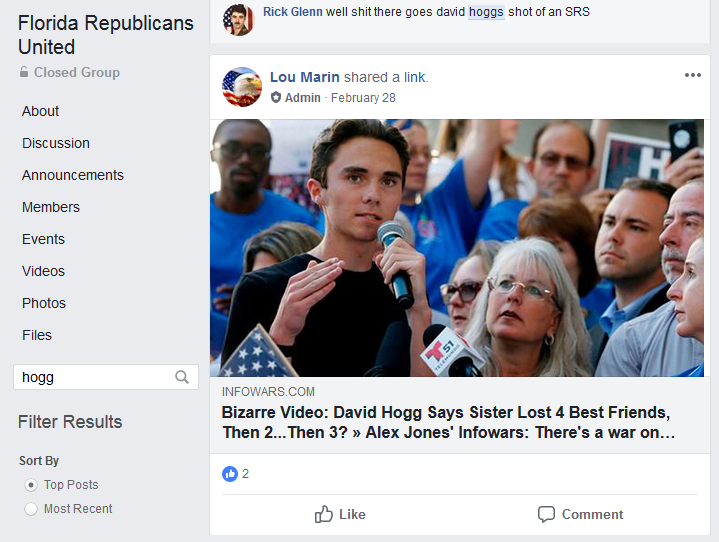 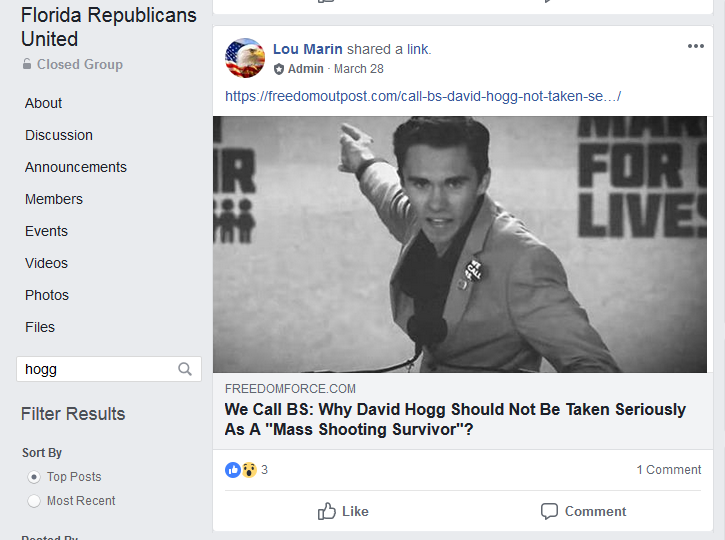 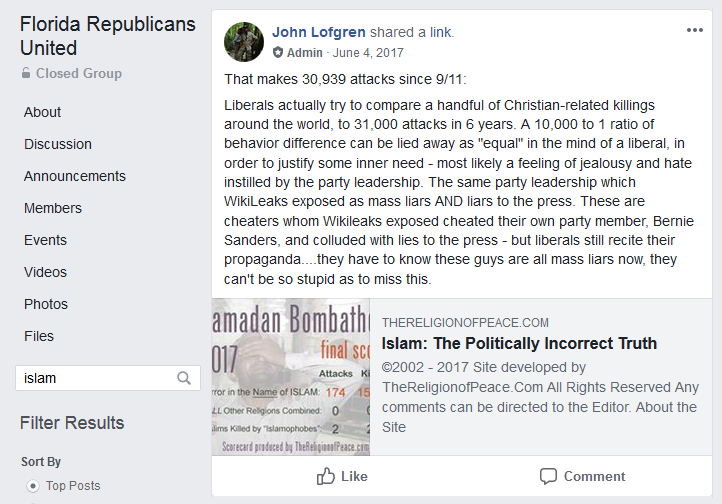 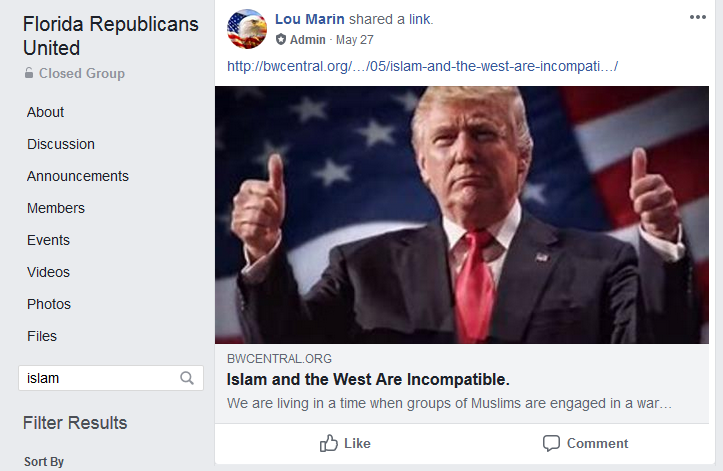 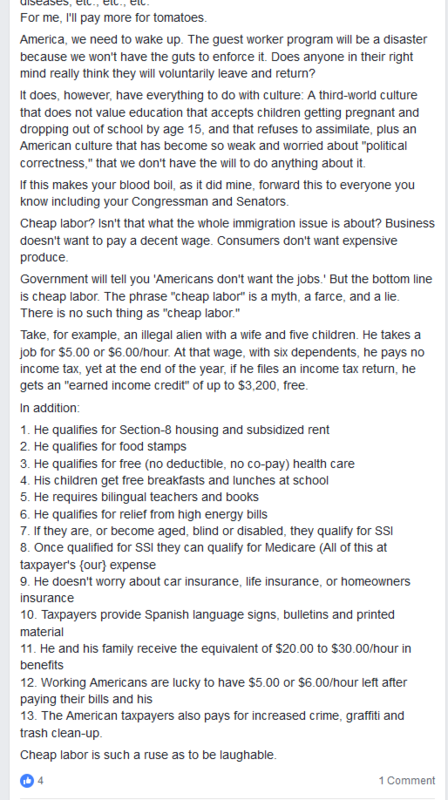 The official Facebook page of the Orange County Republican Executive Committee often posts the same links to far-right conspiracy theories and fake news that Marin posts in the group. 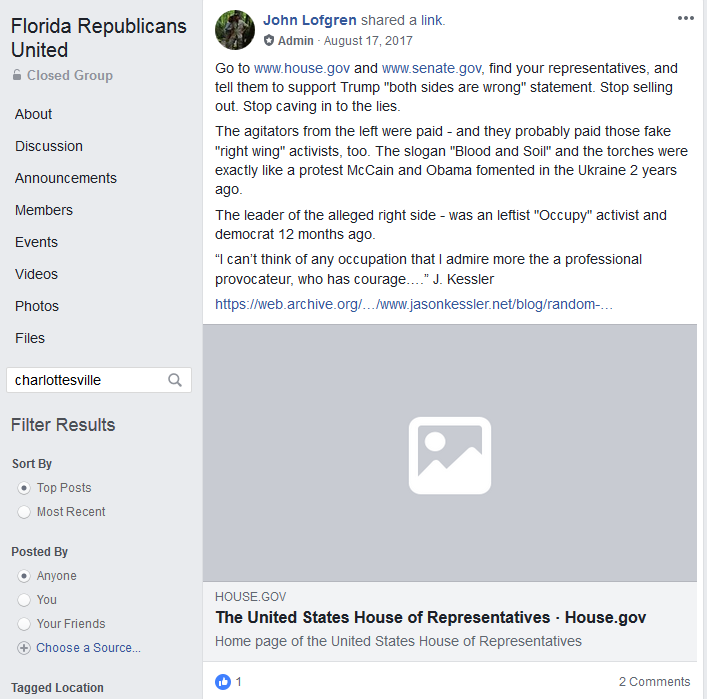 Other administrators of the group include far-right conspiracy theorist Trevor Loudon of New Zealand (who is also an administrator of the racist, conspiracy theory-pushing Facebook group Tea Party) and Keith Flaugh, who founded the conservative anti-science group Florida Citizens’ Alliance. 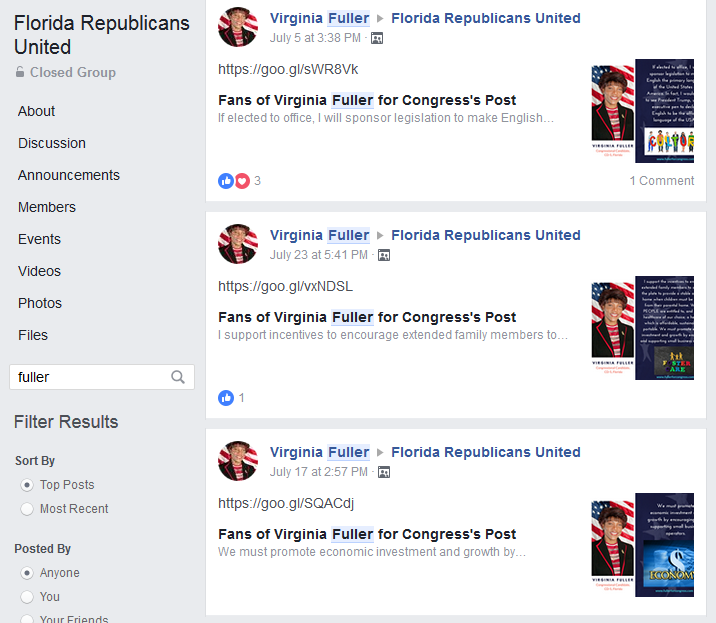 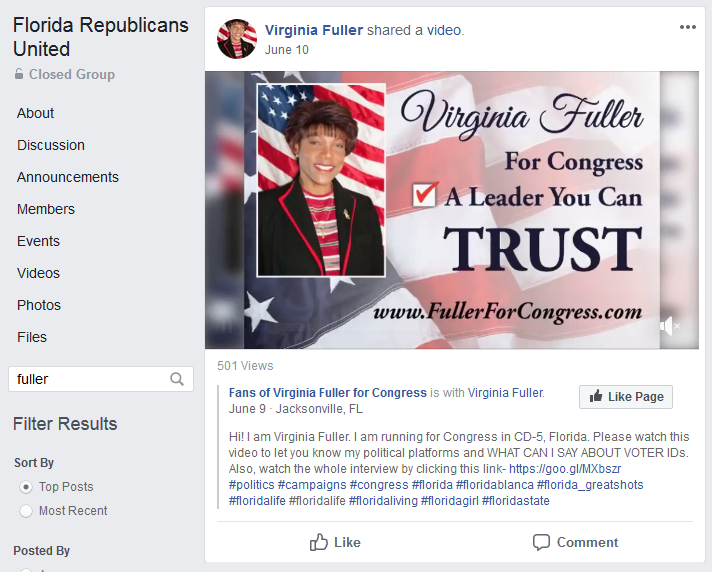 Virginia Fuller is the only Republican candidate listed above who appears to have campaigned in the group. 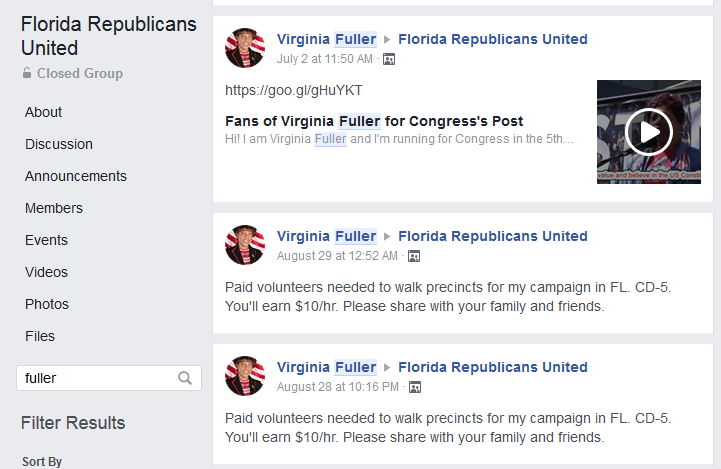 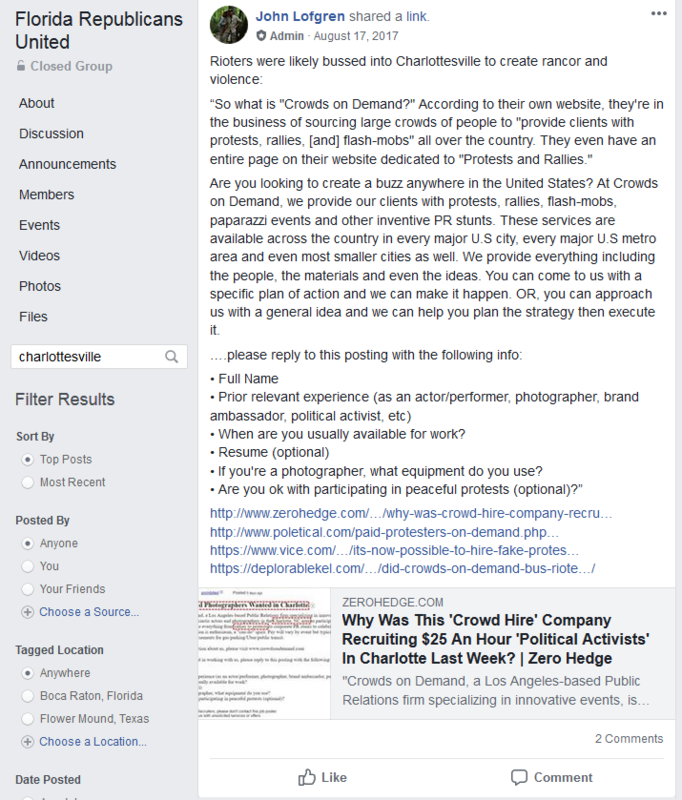 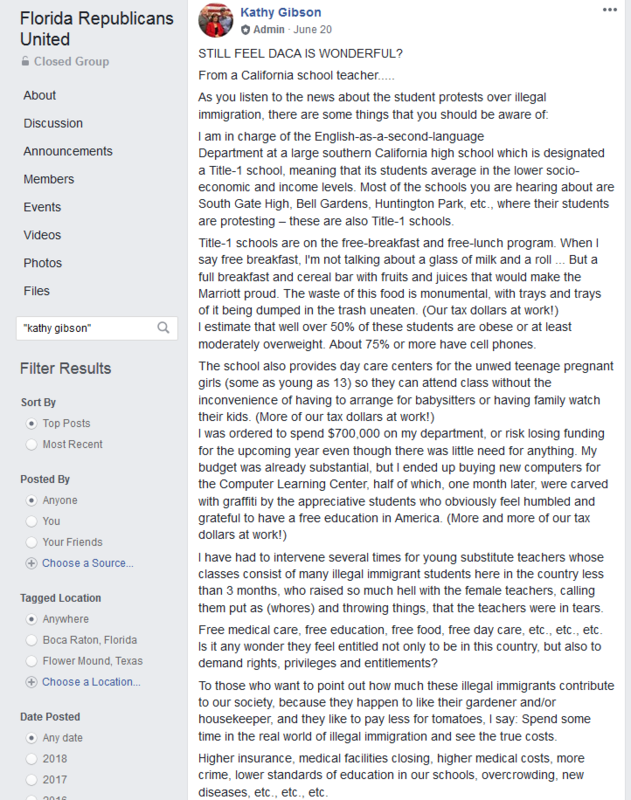 She shared posts from her campaign page and sought paid volunteers in the group multiple times. 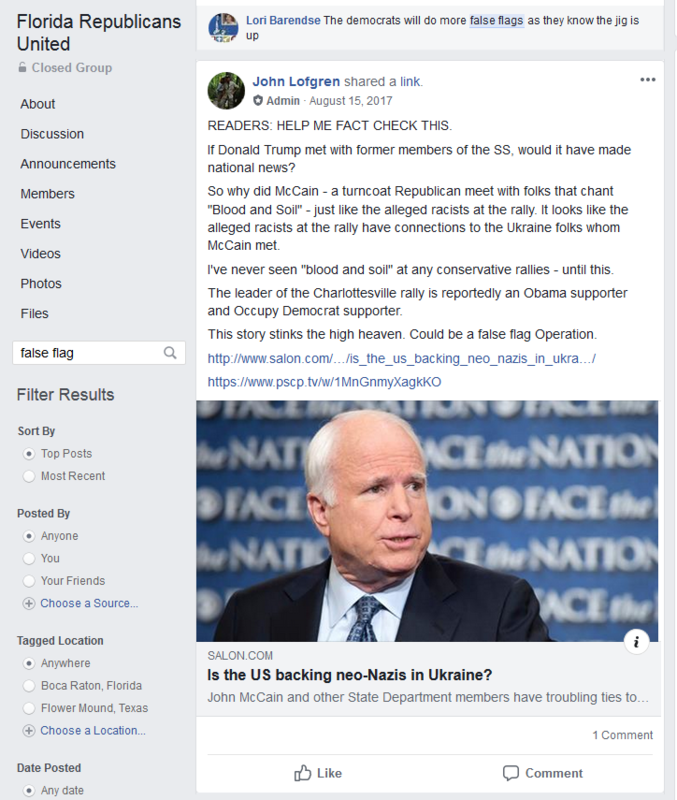 Former Arizona Senate candidate Kelli Ward is also a member of this group. 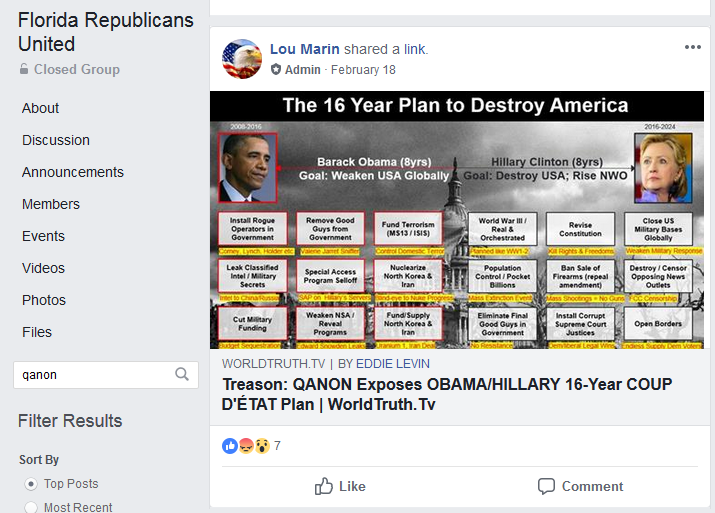 Marin also shared various posts related to the QAnon right-wing conspiracy theory. 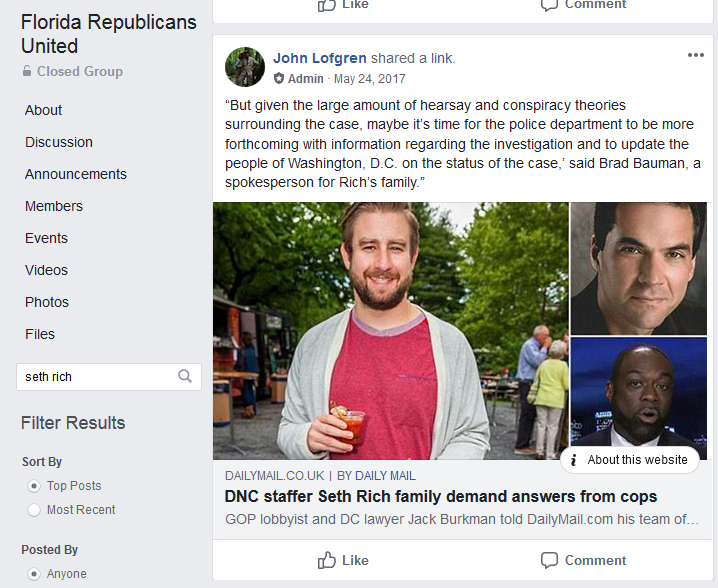 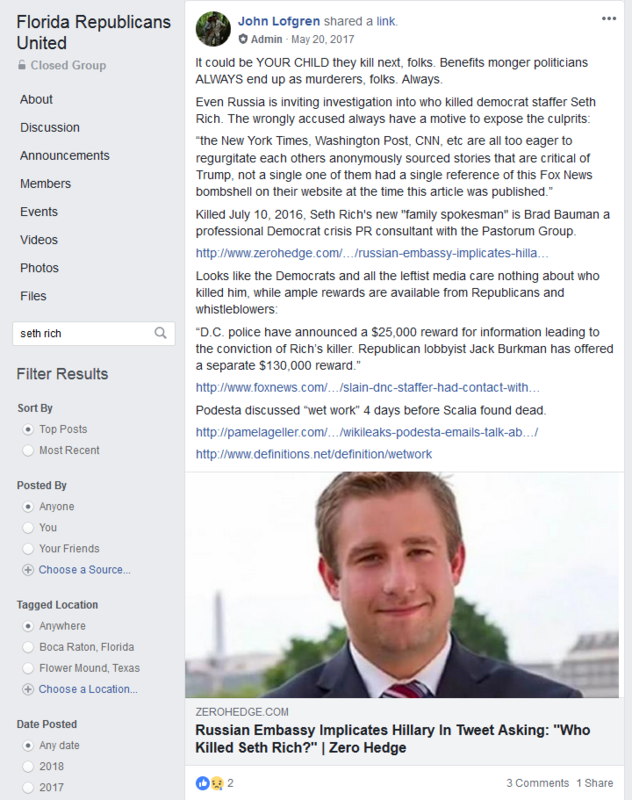 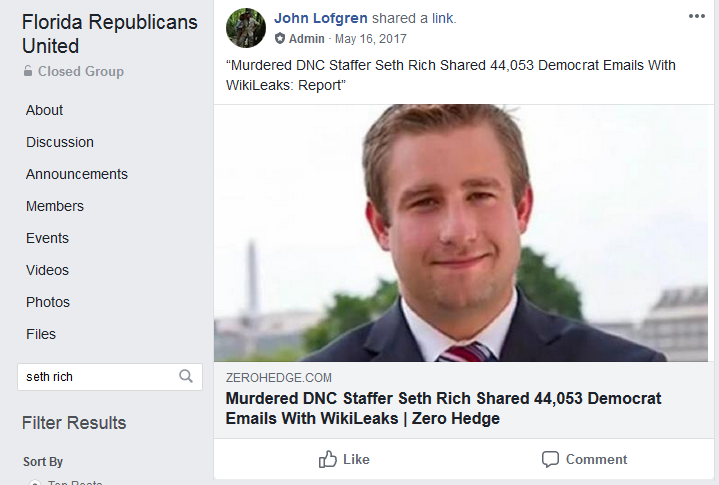 Lofgren and Marin also shared multiple articles supporting far-right conspiracy theories related to DNC staffer Seth Rich’s murder.